Now that St. Patrick’s Day is over I am excited to focus my attention on one of my favorite holidays… Easter! Not only do I love WHY we celebrate Easter, I also love the colors, freshness and happiness that are dominant in Easter decorating. Fresh green grass? Fluffy little chicks? Cute pastel bunnies? Yes, yes and yes. So today I’m sharing an easy little craft that will add the perfect little happy touch to your Easter table this year…. 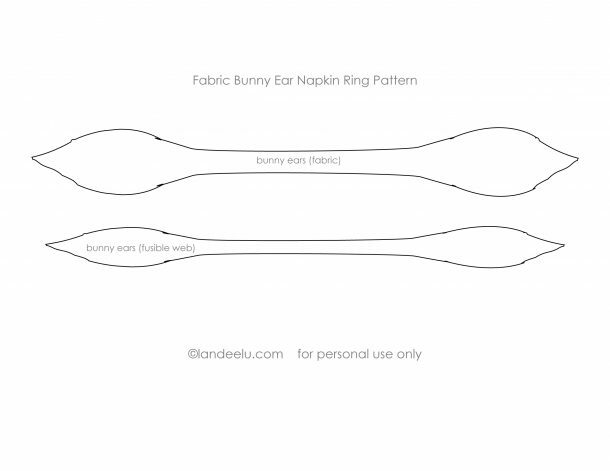 Easter Bunny Ear Napkin Rings! All it takes is a little fabric and wire and you’ll be all set! Fabric (assorted or all the same, whatever you’d like!) And you don’t need much. STEP ONE: Pin two layers of fabric (wrong sides together) and the bunny ear pattern together and cut out. STEP TWO: Cut out fusible web with pattern for the fusible web piece and place between the two pieces of fabric as well as a piece of wire 7-8″ long. Follow the directions for how to use your fusible web. STEP THREE: Place other fabric piece on top and iron pieces together, making sure wire is running down center of pieces (again, follow the directions for your brand of fusible web here). STEP FOUR: Wrap around napkins and twist together to make your cute little bunny ears! Just making these got me excited for spring to arrive! Happy Easter crafting!